The most talked about aviation news of last month was undoubtedly the Vistara Retrojet. It was one aircraft I had leaked on Twitter before the official launch, and when the day of the official unveiling came, I was missing in action, because it coincided with the first Mileage Mentor MasterClass and Points & Pints Mumbai which we were organising for 2018. My loss, as I did not get a Vistara RetroJet scale model to commemorate the occasion. 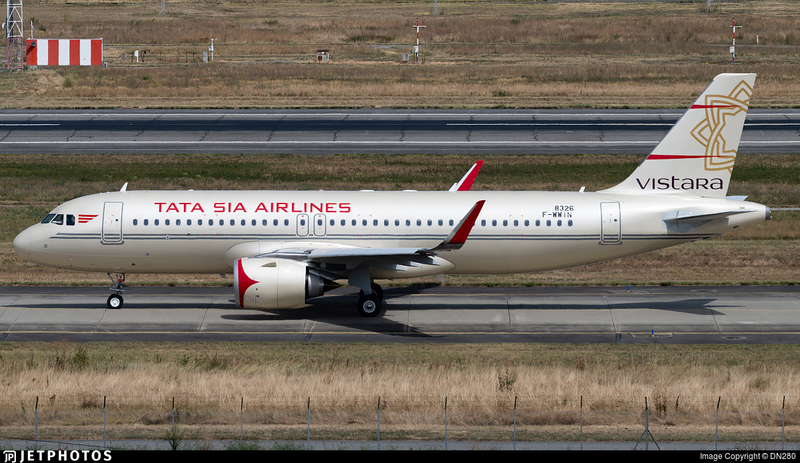 To bring you up to speed with the RetroJet project, Vistara has created a livery which is a commemoration to the 150 years of Tata Sons, their Indian parent company. JRD Tata, the Tata Group founder, is widely considered as the father of Indian aviation, being the founder of the original TATA Airlines as well, before it was nationalised and taken over by the Government of India (now known as Air India). The plane has a tail number VT-ATV to celebrate the Tata heritage, a tail that was used for the original DC-3 aircraft. The aircraft is painted with a special coating which provides a metallic look, similar to the metallic silver of the DC-3. With the right lighting, it also changes hues to an old-world sepia tone. This special livery was kept under wraps as the project progressed over a year, and yours truly amongst some other people was the first one to out it to the world. This special livery is another 25 kgs of paint, so it is only going to be around for one year from September 1, 2018, onwards. It is impressive that Vistara is doing this. Air India, Jet Airways, IndiGo, other airlines. They all had an opportunity, and they passed to do special liveries. Vistara jumped on it very timely. Having missed the unveil event, I wasn’t going to miss the first flight of the Vistara RetroJet, which conveniently overlapped with me being in Delhi for another aviation event. So, I booked away on the Vistara RetroJet on its first flight between Delhi and Mumbai, which was going to fly on September 5, 2018. Not just that, but Shipra also wanted to join in. She flew in on a red-eye flight to Delhi so that we could fly back on this exciting first flight from Vistara. I think of myself as the unofficial historian of this airline, given I’ve been tracking their history from the reveal of the product to their first flight, to the launch of their co-branded credit card and revamp of their loyalty program, and then their new plane order. On the day of the flight, we arrived at Delhi Airport in the midst of a lot of rain. I was eager to find out what was the first flight going to look like. At the airport, we collected our boarding passes. We were flying Premium Economy today, and stupid as it sounds, I did not think of upgrading to Business Class at the counter, I was so excited. We headed to the Business Class queue at Delhi Airport Terminal 3, which also takes in the Premium Economy passengers. After the security check, we headed to the Vistara Lounge, which is accessible to all Vistara Gold members even if they are not flying Vistara Business Class that day. I ran into a familiar face here, my namesake, AJ who is a moderator on FlyerTalk and one of my oldest buddies from the Frequent Flyer community, was also joining the flight, and he was in Business Class. Here is a first picture of the tail of the aircraft. Magnificent. To ensure that everyone got a good look on the plane before the flight, Vistara deliberately chose a bus gate for the aircraft, rather than an Aerobridge. But how do you deal with a bus gate during the rains? You make sure you put enough people to cover you. There were many folks with a yellow umbrella. There was a massive set of ladders organised to bring people up to the door, and in a classic Vistara touch, everyone had yellow umbrellas to add a pop of colour to this gloomy morning. Too bad, security concerns did not allow me to walk around to take a picture of the grandiose welcome. And the rains of course. At the entrance, instead of being met by a cabin crew member, passengers were met by the CSCO of Vistara, Sanjiv Kapoor himself. 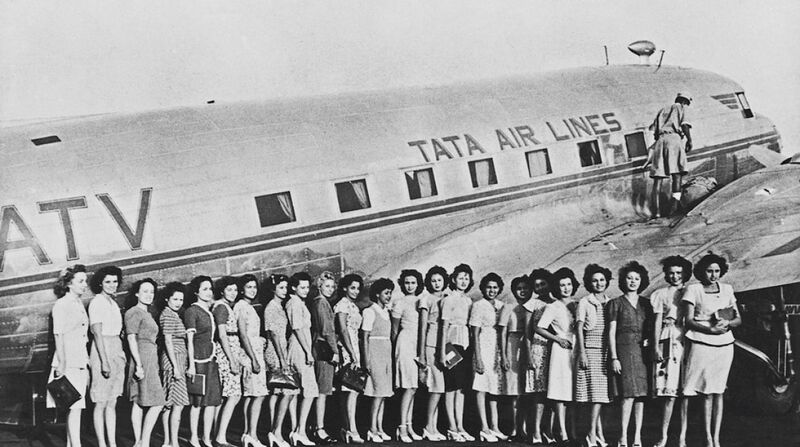 On board, the first thing you’d notice is the crew wearing vintage Tata uniforms in Lilac and Pink. These are creative interpretations of the original outfit and are complete with double breast jackets and pump shoes. It seemed most customers were caught unaware of the significance of this particular flight. So, naturally, they were confused when they saw me and a couple of other avgeeks taking pictures. The gentleman sitting next to me did ask if we worked with Vistara. I smiled and walked him through why there was so much excitement. The Vistara Premium Economy experience is a good crossover between Economy Class and Business Class. Vistara has brought in various features of J class on their Premium Economy product. For instance, the seats are very well padded and carry the Business Class hues, not the Economy Class colours. There is more legroom between the seats as well. I wrote an extensive piece about Vistara’s A320Neo product, which can be read here. The captain and the cabin crew made repeated announcements about why this flight was exceptional. Soon enough, we were strapped into our seats, and the Premium Economy service started. First came the towelettes. Then, menus were distributed to the passengers. PEY passengers receive three meal options, including one which was JRD Tata’s favourite dishes. You’d notice that the menu was also printed in the same hues as the aircraft. And they narrated the story of the special aircraft. Soon enough, we were ready to take off and headed to the runway. Once airborne, the meal carts came out quickly, not giving me an opportunity to head out to take pictures of the aircraft. Flight crew were paired in lavender and pink. As avgeek as it could get, I went for the Omelette, which was a recreation of the one from the Taj kitchens, as JRD would like it. It was a delicious meal, and then I was stuck in my seat waiting for the trays to clear out. In the meanwhile, I tried out VistaraWorld, which has made a second coming on Vistara, and is now live across all Vistara aircraft. I will review the new VistaraWorld separately. I went into the aisles for a bit after and was caught on by the group chef from the TAJSats kitchen who had brought the entire meal experience together for this flight. Rajeev Bansal, who has been creating meals for Vistara for a very long time, gave us titbits into how he had been freshly into hospitality and JRD was such a reticent man only a few people knew how he would want to eat. The flight experience was not your usual flight for sure. Apart from regular commercial passengers, the aircraft was full of avgeeks, and avgeeks who are Vistara employees. I had the pleasure of shaking hands with Sanjiv Kapoor again on board, also with the Marketing Head of Vistara, Solomon Wheeler and many of their other associates who I follow on social media. I made it a point to make one of the onward and upward move pictures that Vistara seems to be putting out so many of these days with the team. Shipra happened to dress up to match with the crew, while my suit had a wardrobe malfunction, so, swapped it out! One thing I did miss, and the airline is hopefully rectifying in the coming week, is unique memorabilia for those who will participate on these flights. Certificates would do just fine. The airline plans to make about seven days of these special flights in the whole of the year where the flight crew will don the retro uniforms and serve up a retro menu. The first already happened on September 5, 2018. The next one will come up on October 15, 2018, when the Retrojet takes to the sky with a unique flight number UK1, tracing Delhi – Ahmedabad – Mumbai. In case you are interested in the experience, seats are still available on the 5 flights (Delhi – Ahmedabad/Ahmedabad – Mumbai/ Mumbai – Delhi/ Delhi – Bengaluru & Bengaluru – Delhi) which are scheduled on October 15, 2018. Are you planning to fly the Vistara special flights? What do you think of the Vistara RetroJet? Flying in J on DEL-BLR on 15th. Looking forward to the experience! “The next one will come up on October 15, 2018, when the Retrojet takes to the sky with a unique flight number VT1”. I think it should be UK1 instead of VT1. Glad to hear your great experience. I am using this forum to highlight a rather unpleasant aspect of this Airline. Specifically Vistara Direct a feature advertised by them. Briefly you book directly with them without a travel site between you and Vistara gives you priority boarding, 100 bonus points etc. The problem occurs when you opt for the senior citizens privilege. Though you have booked on their site in terms of their advertisement, your boarding card gets the senior citizens code and just for a teenie weenie discount, they kick to the back of line. After exchange of several letters with their customer care, who assure that all their staff has been sensitised, they continue to behave in a boorish manner. My lawyer tells me to take them to court. I will keep you posted. I can send you my mail exchange if you wish. Moral of the story :No point in trying to cash in on the JRD heritage when you don’t mean to maintain those standards.